For those of us who want the Toyota Corolla to not only be a global bestseller but a damn good compact car – it appears we are in for a treat. At this point, it’s not worth quoting the number of Corollas sold worldwide since 1966. It’s probably at around or beyond 45 million by the time you’re reading this. This year marks the introduction of a twelfth-generation model. So far, the reception of the new Corolla has been very positive. The strategy for the world debut of the twelfth-gen Corolla was quite interesting. You see, North American models have mostly been sedans, with some coupes, wagons, and hatchbacks thrown in for measure throughout out the decades. The wide selection of Corollas helped keep it in our conscious, whether it is back in Japan, across the USA, deep into Europe, Asia, Africa, the Middle East, Australia – and everywhere else in-between. For this generation, Toyota chose the Hatchback – known as the Auris in many markets worldwide – as the initial body style for the new Corolla. This includes the USA and Canada. The twelfth-Generation Corolla is based on the Toyota New Global Architecture. This new platform is shared across many vehicles from small cars to mid-sized SUVs – a familiar strategy seen at various automakers these days. 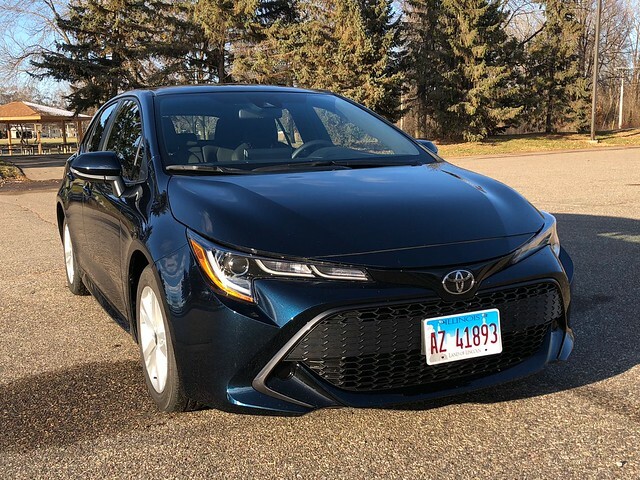 The trick to making this Corolla stand out apart from the other TNGA offerings is to concentrate on its core tenets while elevating areas where it would engage with new owners. The design alone is one example of the latter. It is sharper – definitely influenced by recent designs on a few Toyota models so far. It is safe to say that it is one of the best looking Corollas of all time – which will bring up arguments from the AE86 caucus, as well as other defenders of Corollas past. The evidence is there. The bold front end utilizing a large mesh lower grille and “boomerang” headlamps with a combination of projector beams and LED driving lights. An upper grille bridge the headlamps with the Toyota badge, finishing up the aggressive welcome the Corolla Hatchback offers to the world. From that point rearward is a flow that envelops the front end to the A-pillar. A new quarter glass on the front doors helps with critical vision on each A-pillar. The front doors open wide for many occupants. Then, it gets quite interesting from B-pillar on back. While it rides on a 103.9-inch wheelbase, the hatch measures out to just 172 inches long. In contrast, the eleventh-generation sedan has a 2.4-inch longer wheelbase and 11 more inches of overall length. Yet, the new hatch is actually longer in both wheelbase and overall length than the previous Corolla/Scion iM/Auris hatchback. These facts come into play in several ways. First off, the rear doors are shorter, the C-pillar lacks a glass pane, but the roofline actually looks cooler. The hatch itself has a bubble-like style that opens wide and finishes off the overall design of the Corolla Hatchback. This also affects some key area inside the Corolla Hatchback. The rear seat room is much smaller – one could say that it is a pinch better than the Yaris hatchback. Average-sized adults will be fine inside the Corolla Hatch, however. The cargo space has been reduced compared to the previous iM hatchback – by 3 cubic feet. In one instance, I certainly noticed the difference when putting a full laundry basket in the rear. The floor meets the hatchback opening, but I would love to see it go deeper. Perhaps I should be thankful that underneath the floor is a spare tire and all of the tools necessary to replace a flat. Not to mention, the overall space behind the rear seats is not a deep as in the iM. However, everything else about the Corolla Hatchback’s interior is all superb. The front seats are bolstered with plenty of support to lock you in. 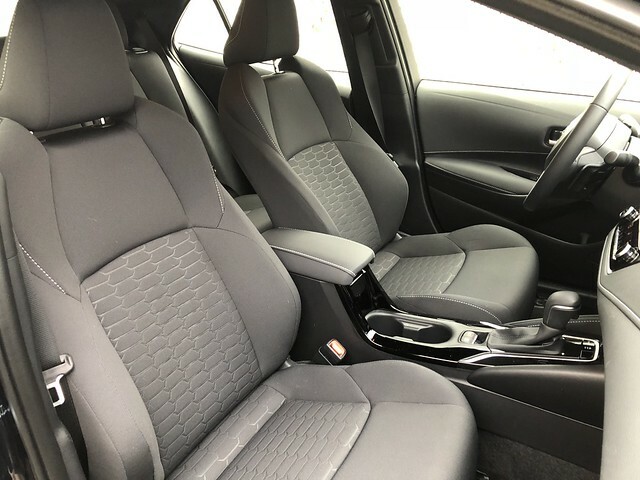 The cloth upholstery is durable and wears well. My SE tester came with manual adjustments for height, rake, and recline. Behind the wheel, there are major leaps in every part of this Corolla. The instrument binnacle offers a big center analog dial, a tachometer to the left, and an excellent TFT screen to the right giving you loads of information. The steering wheel had a thick rim for better grip for enthusiasts. I love the positioning of the gear lever and center stack controls, including climate controls. Overall interior quality is astoundingly fantastic – a huge step in Corolla history! Toyota has joined the tablet-like infotainment system trend. 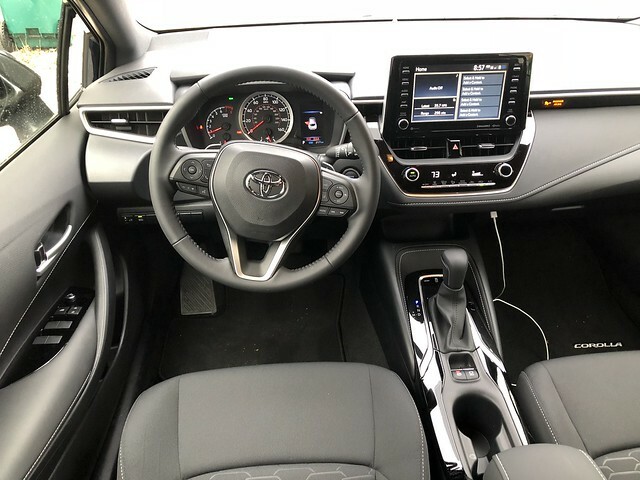 The big screen on top of the center stack may seem a bit of overkill, however, it is extremely functional with connectivity via Toyota’s Entune 3.0 infotainment structure. This enables one to use Apple CarPlay through the system – that would be the third Toyota to utilize this with the upcoming RAV4 and 2020 Corolla sedan joining the fray. Though Toyota has made huge leaps in design and interior design, I need to make this audacious statement. Some years ago, I said that my favorite Corolla of all time was the FX16 – a three-door hatchback that was Toyota’s answer to the Volkswagen Golf GTI. We’re talking the 1980s here, when Toyota crafted a dual overhead camshaft, 16-valve four-cylinder engine – the 4A-GE and its Yamaha-developed cylinder head – that sent the entire automotive world back to their respective drawing boards. Regardless of how your memory serves you, I believe you will like this new 2.0-liter engine and its ability to manage the road ahead. While most of us are not fans of continuously variable transmissions, the one connected to my tester will change your mind. 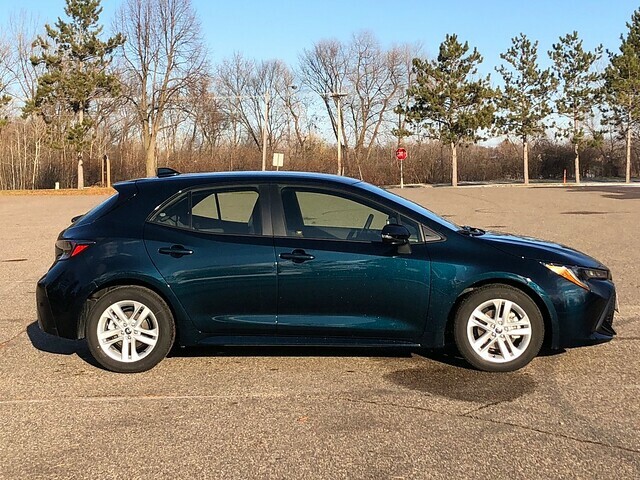 Unlike some CVTs that just wind up until it reaches the red line to drop down to a cruising ratio, the one in this Corolla Hatchback is more flexible and responsive. 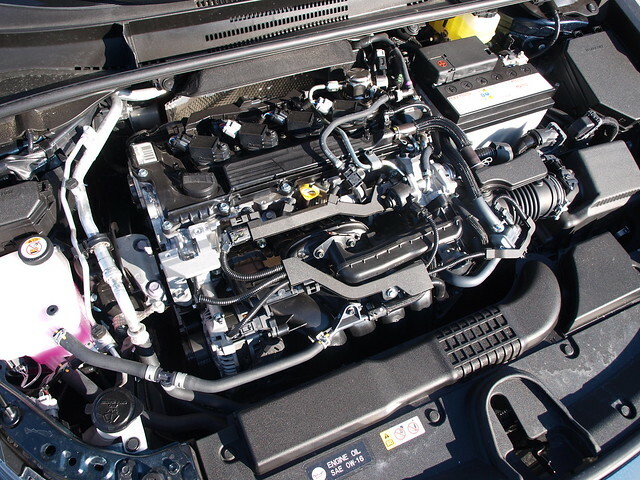 This combination of a new, more powerful engine and a more responsive CVT yielded a fuel consumption average of 35.3 MPG – which is considered very good, in my book. What will really make you love the new Corolla Hatchback is the chassis it sits on. This is not just about the TNGA architecture, but rather how it works on this particular car. Of note is the trailing wishbone suspension in the rear, which helped in maintaining a sharp edge on the road. The ride/handling mix is superb, as rougher roads were absorbed well for a good ride while managing the curves with ease. The steering serves up a tight turning circle through a light feeling system. On-center feel is very good, and it is quite responsive. The brakes are very solid with good pedal feel. The Corolla exhibited good stops in normal and panic situations. It also tracks very well in winter situations, even with Dunlop all-season tires. One good thing to note on the Corolla Hatchback is the standard availability of the Toyota Safety Sense suite of active safety features. There is adaptive cruise control on both the SE and XSE hatch, which works very well and will make traffic management much easier. 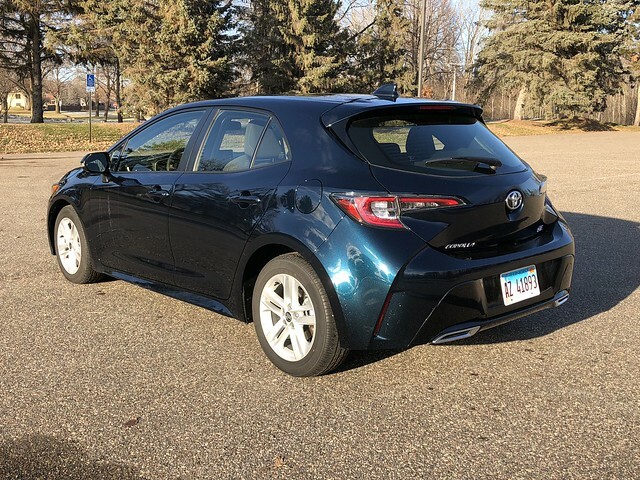 Pricing for the Corolla Hatchback starts at $19,995 for a manual transmission SE model. In fact, both the SE and XSE offer the choice between the six-speed manual or CVT. My SE tester with the CVT was stickered at $23,639. The bulk of the price came from an upgrade on the infotainment system. As I was receiving this Corolla Hatchback, a related event took place in Carmel, California that is worth noting. I eluded to the 2020 Corolla sedan, which appeared at this event at the tail end of the 2019 RAV4 media drive. I did see plenty of continuity between the Hatchback and the upcoming sedan – more so than the soon-to-be-departed eleventh-generation model. If the sedan is as good as this Hatchback – the Corolla lineup will be one to take notice from both consumers and enthusiasts. The enthusiasts are already on board with the new Corolla Hatchback. It satisfies them well, though some may want a more powerful engine to compete against the Volkswagen Golf GTI. Yet, it has a way to excite those who are lured to its charms. It does so by looking sharp and bold, doing things that exceed the previous expectations of Corollas past (unless you fondly remember the AE86, FX16, and XRS), and executes all of this by putting a smile on your face. 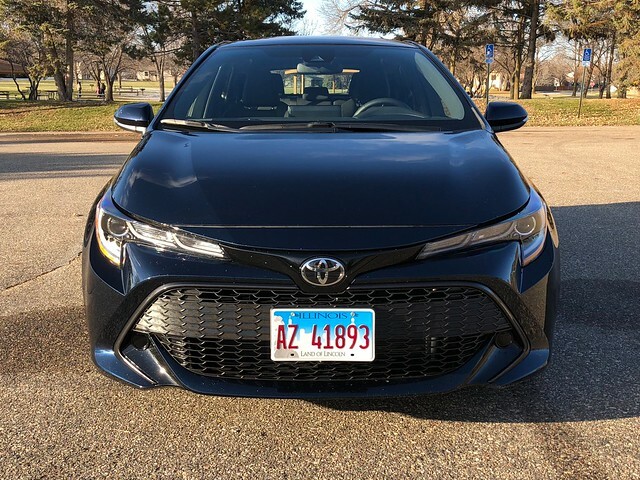 In the case of the 2019 Toyota Corolla Hatchback, that smile should be stretching from ear to ear.